BlockTheAdApp is capable of many different things, including the unauthorized infiltration , illegal connection to the Internet and the representation of annoying pop-up advertisements. We are sure that this is not what you expect if you trust the promotion on blocktheadapp.in and believe the offered application to help you remove YouTube advertisements. 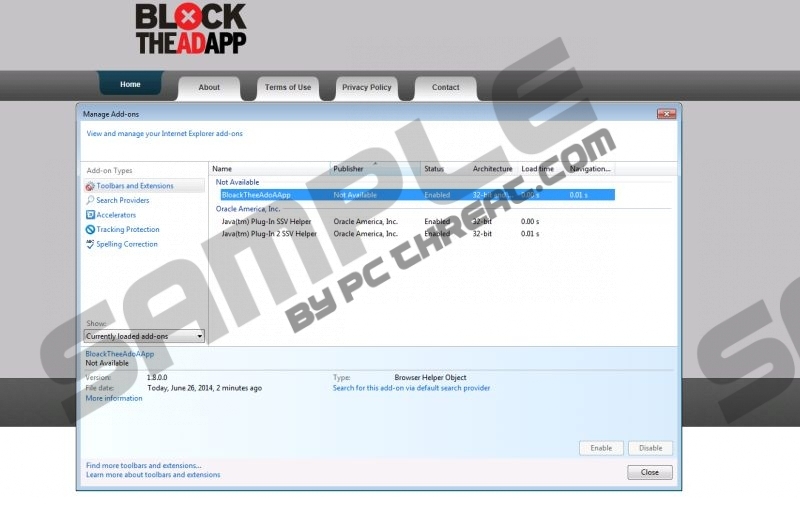 Luckily, you can remove BlockTheAdApp from the PC and avoid any risks related to it. Continue reading to learn what these risks are and how you can delete undesirable software from your own computer. Have you recently interacted with the InstallRex or DomaIQ installers? These may represent seemingly authentic and harmless applications. Do not be fooled. The installers of alluring applications could hide the bundled installers of adware and potentially undesirable programs. In the worst case scenario, you could be tricked into downloading fake malware removal software and other dangerous threats. Note that in some cases you may have the option to decline the additionally offered applications, and this could save you from lengthy and complicated software removal operations. BllockTheAdAppi, BloCkTheAdApPa, BlocKTHEAdApp are the different names which could represent BlockTheAdApp. Do you know why the creators of the application randomize the name of the threat? It is done to trick the installed malware removal software that a program which is set for removal is not even detected. This malicious activity is also related to other software distributed with the help of unreliable installers, including AllTubeNoAds, TubeAddbloeccker and YTBlockerApp. Note that these programs usually hide behind the installers of fictitious Java and Flash updates. You should realize you need to delete BlockTheAdApp right when the first pop-up and banner ads show up on Google Chrome, Mozilla Firefox and Internet Explorer browsers. These advertisements may present additional bundled installers hiding the setups of even more disturbing and unreliable advert-supported programs. You should ignore the flooding ads for the time being and rush to delete the disturbing advertisement supported program BlockTheAdApp. Malware comes in different shapes and forms, and computer users often fail to recognize that browser extensions they may download themselves are malicious. Even if it does not look like a dangerous program, you certainly should delete BlockTheAdApp. This potentially illegally running application can track your activity, share information with third parties and enable the onslaught of potentially unreliable ads. Even though manual BlockTheAdApp removal is a possibility, automatic malware removal software is irreplaceable when dealing with advertisement supported software or any other threats. Finally right-click the undesirable application. Quick & tested solution for BlockTheAdApp removal.